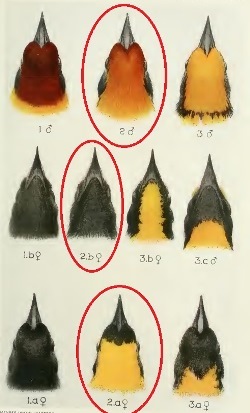 Preuss's Weaver heads (circled), cf. The Preuss's Weaver was formally described by Anton Reichenow, a German ornithologist and herpetologist. The Preuss's Weaver was collected by Paul Preuss, a German botanist and collector (born in Prussia). Preuss lived in Sierra Leone from 1886-1888, and then was sent to help in the Zintgraff military expedition to Kumba, western Cameroon in 1889-1892, as most of Cameroon was a German colony. The troop commander was killed in action, so Preuss took charge and led the troops back to the coast. In Victoria (now called Limbe), on the southern slopes of Mount Cameroon, Preuss had time to collect plants and some birds, including Preuss's Weaver. His specimens were sent to Berlin where Reichenow described the new birds. Preuss founded the botanical garden at Victoria in 1901, and he served as first director until 1902. Preuss collected two male specimens but these were not illustrated. The first illustration of Preuss's Weaver was of a juvenile, published by Sjostedt (1895). The next illustration was of the heads of this species in Ogilvie-Grant (1917), who compared the species with other similar species. Symplectes preussi	Reichenow 1892c,	Journ. f. Orn., 40, p.442,	Victoria, Cameroon. preussi, Named after Paul Preuss (1861-1926), a German botanist and collector in West Africa, 1886-1888, 1892-1898 and New Guinea, 1903. 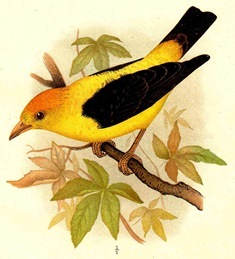 Golden Black-winged Weaver (Shelley 1905b). Congo Golden-backed Weaver, Golden Black-winged Weaver, Golden-backed Weaver, Golden-capped Weaver, Golden-mantle Weaver. The type is in the Berlin Museum (ZMB_29953).